Nutmeg's story isn't peaceful. 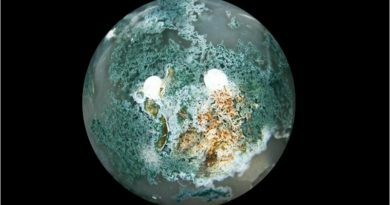 Although it is considered a lucky spice now, it has been quite the unlucky spice for some in the past, and as such, its history is filled with blood. What began as an exclusive crop to the Banda Islands quickly became and excuse to enslave and kill many islanders native to the region. Nutmeg's lessen is quite clear -- don't go overboard. Nutmeg's allure is intoxicating, and as is the case with almost all other uses of nutmeg, a little bit goes a long way. In cooking, if you use too much nutmeg you will spoil the meal. 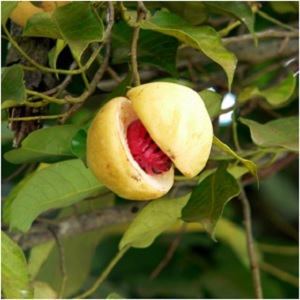 Nutmeg is a toxic hallucinogen when over-consumed, so don't eat too much of it. When using nutmeg in magical practice, don't overdo it -- It's power is quite potent. 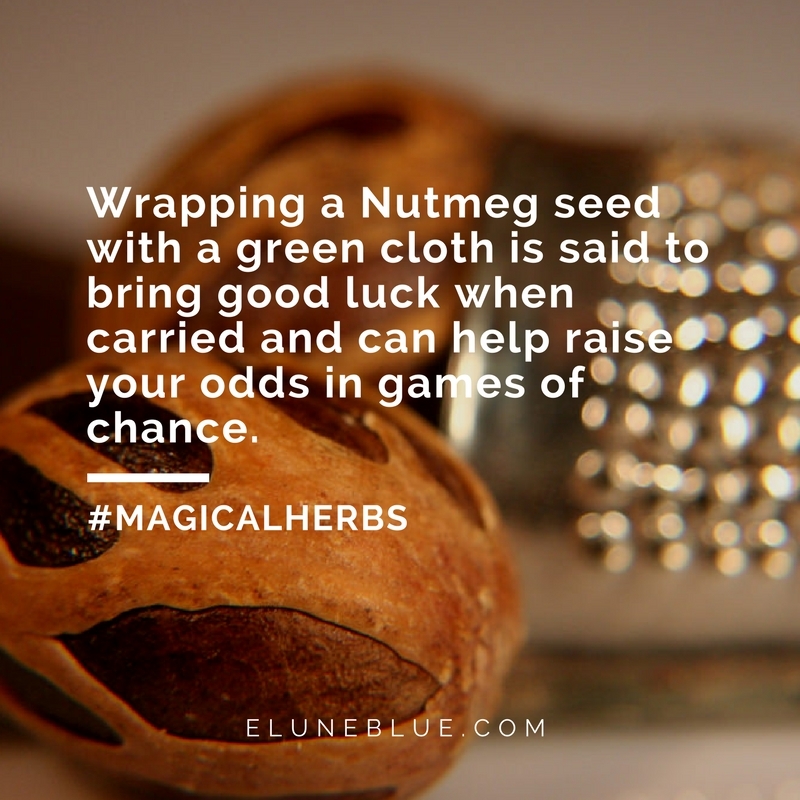 Nutmeg is associated with good luck, so be sure to carry a nutmeg seed before getting involved in games of chances to swing the odds in your favor. Drilling a hole in a nutmeg seed then filling it with mercury or wrapping the seed with a green cloth can potentiate this effect. Carry nutmeg as a charm and wrap it in purple cloth before dealing with legal matters to strengthen the likelihood that your legal situation will end favorably. Carry nutmeg while traveling for a little extra good luck. Share a beverage that contains nutmeg with the one you love, and that will help in having those feelings returned. Nutmeg is associated with fidelity, and can be used in spells to help ensure your lover’s fidelity and ward off temptation. Nutmeg is a perfect holiday spice in that it can help lessen tensions and conflict that can arise during the winter months due to lack of sunlight. Diffuse nutmeg essential oil to revitalize the body and strengthen the flow of energy throughout the body and soul. Nutmeg has strong divinatory properties, and when added to a beverage and consumed before meditation, can heighten the meditative experience and encourage visions and clairvoyance. A nutmeg massage oil or nutmeg butter can also help towards this aim. Nutmeg oil can be used to draw money; use it to anoint green candles and magical tools to draw wealth to the household. 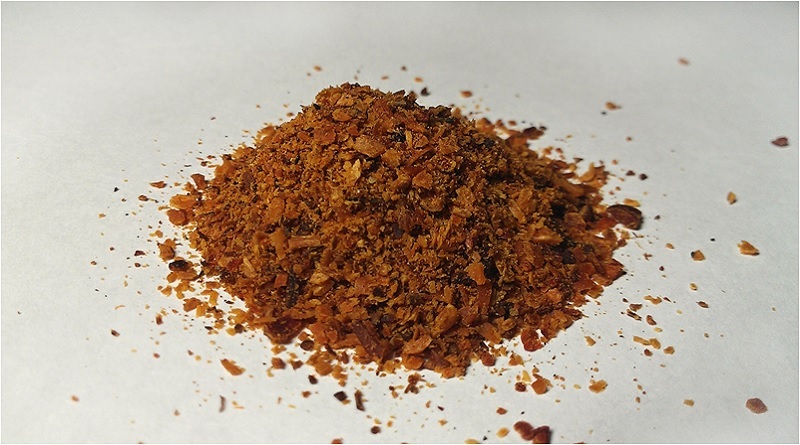 Nutmeg powder can be used to draw prosperity. Sprinkle it over candles and other objects or add it to candle wax and use when casting a money drawing spell. What are Your Thoughts on the Magic of Nutmeg? What do you think about Nutmeg and its wonderful, magical properties? Do you have any other creative ideas on powerful ways to use this plant? Is there an herb or plant you would like us to discuss? What bring you to this article today? We'd love to hear from you! "Nutmeg." Nutmeg - Witchpedia. N.p., n.d. Web. 15 Aug. 2016. Herbalriot. "The Magickal Uses of Nutmeg." Herbal Riot. N.p., n.d. Web. 15 Aug. 2016. Thring, O. (2018). Consider nutmeg. [online] the Guardian. Available at: https://www.theguardian.com/lifeandstyle/wordofmouth/2010/sep/14/consider-nutmeg [Accessed 29 Mar. 2018]. Encyclopedia Britannica. (2018). Nutmeg | Tree, Uses, History, & Description. [online] Available at: https://www.britannica.com/topic/nutmeg [Accessed 29 Mar. 2018]. Blum, D. (2018). A Warning on Nutmeg. [online] Well. Available at: https://well.blogs.nytimes.com/2014/11/25/a-warning-on-nutmeg/ [Accessed 29 Mar. 2018]. The Spruce. (2018). The Nomadic History of Nutmeg and Mace: From Banda to Britain. [online] Available at: https://www.thespruce.com/nutmeg-and-mace-history-1807632 [Accessed 29 Mar. 2018].